His biennial budget will include $26.4 million to expand workforce credentialing at Virginia’s Community Colleges, the governor announced on Dec. 15. About 1.5 million jobs will need to be filled between now and 2022, and most will require a workforce credential or skill rather than a traditional four-year degree. Employers report that they struggle to fill jobs due to a lack of skilled workers. On Dec. 11, Gov. 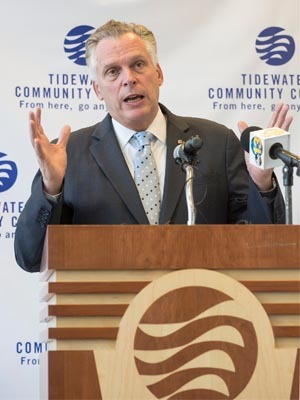 McAuliffe came to TCC’s Portsmouth Campus to announce funding for veterans’ initiatives. “Of 23 community colleges, I chose to be here because of the great work TCC is doing on behalf of veterans,” he told about 75 people. The audience included State Sen. Louise Lucas and Delegate-elect Steve Heretick; Portsmouth City Council members Bill Moody and Elizabeth Psimas; and TCC leaders including President Edna V. Baehre-Kolovani, Provost Michelle Woodhouse and Bruce Brunson, executive director of TCC’s Center for Military and Veterans Education. McAuliffe pointed out that veterans make up about 10 percent of Virginia’s population and that the state has more veterans under the age of 25 than any state in the union. One of his largest proposals is $2.2 million over two years to create veteran advocate positions at the seven Virginia community colleges that serve the largest veteran populations. “The first grant awardee will be TCC,” he said, noting that one-third of the college’s enrollment comprises military-related students – active-duty, veterans, spouses and dependents. The governor’s proposals also include $1.2 million for a “veterans portal” through the Virginia Community College System to strengthen outreach related to workforce credential opportunities. Gov. McAuliffe will announce his full budget to the General Assembly on Dec. 17. Lawmakers have scheduled a budget hearing Jan. 7 at noon on TCC’s Chesapeake Campus.